Only a small fraction of massage therapists use any assessment testing in their practice. Although most massage training includes some type of kinesiology and assessment tests, therapists quickly forget this information and rely only on their touch. Touch is powerful, and because of this, most therapists don’t find a need for any assessment testing. I believe that adding a few simple assessment tests can dramatically enhance the massage experience. The problem with testing is that there are too many tests. After making many dvds on orthopedic testing, even I can’t remember them all. Also, in a normal massage practice, muscle tension dominates the client’s complaints, and so a therapist with good palpation skills can easily find the areas of complaint and relieve them. Finally, many clients don’t expect to have any testing done. What we really need is a simple set of tests that we can do quickly that will reveal restrictions to both the therapist and client. Due to the complexity of all the orthopedic tests, we need some simple tests that can be done quickly, and are applied to every client every session. Range of motion testing is the perfect answer to these requirements, especially since we are working with muscles, which control the joints. By performing a quick full body range of motion testing sequence, we can see where someone is restricted. This tells the therapist where to work, but just as importantly, alerts the client to an area that needs attention. This can create a goal that the therapist and client can work towards. Tension is the precursor to injury, and restricted range of motion is an indication of tension and dysfunctional movement. By revealing these areas to a client, we can design session that will not just get them out of pain now, but make them healthier in the future. Many of my students reflect that people who come to spas don’t want any testing. I contend that every human wants to be listened to deeply. We listen to our clients when they tell us where they hurt. We can listen to them with our eyes when we notice one shoulder is higher than the other. We can listen to them with our touch when we flex their wrists, elbows or shoulders and notice restriction. To spend 90 seconds to go through some tests that reveal major holding patterns usually is met with excitement by clients. Therapists that can engage with their clients, and focus on what is needed, are the therapists that are successful. The fact that 99% of therapists don’t do any testing before the session means that there is a huge potential for massage therapists to create even more value for their clients. The basis of this work is finding joint restriction using range of motion tests, and pain with strength testing. Once we find an area to work, we apply the same type of techniques to each muscle group. Then we retest and repeat until the client is pain free, and their range of motion has increased. When we perform range of motion tests, we usually try to compare the side we are testing to the other side and notice which side is tighter. In this way we don’t have to memorize (and forget) the exact degrees that a joint should move, and can learn this organically through working on our clients, and having their bodies guide us. The techniques are applied from least intense to the most intense. 1. Apply static pressure to the muscle bellies. 2. Apply static pressure and add passive joint motion. Focus on the end range. 3. Apply static pressure and have the client actively move the joint into the restriction. 4. Move the joint into the area of restriction, then have the client actively push against your resistance. Finally we move the joint through it’s range of motion to normalize movement pattern. Repeat any of the above in any order until you can feel the tissue has softened, and the ROM has increased. Retest for length and pain. Finally, there is a strange occurrence when working on clients on the table. Although the ROM has increased when retested on the table in the prone or supine position, when sitting up or standing, it is limited again. For this reason we always keep a few minutes at the end of the session to work with the client sitting up. A few minutes of work moving through the range with a little pressure in the right spot is enough to get the client to the 90% improvement that we are looking for. If we can get them to this 90% pain free position, then we know we can help them in several sessions. The 90% pain free is because of the numbing effect of the work. Massage numbs the tissues through chemicals released in the spinal cord after pressure is applied to an area. These chemicals cause the pain signal to be blocked, as well as the motor nerve to be inhibited, which is why the client experiences the pain decreasing at the same time the therapist experiences the muscle softening. Finding the correct site of tension and applying correct massage protocols will numb the area, increase blood supply, and stimulate a healing response through the slight agitation that massage offers. A few sessions of this type of work usually can resolve most muscular issues. 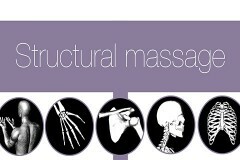 To summarize, Structural Massage is defined as bodywork that includes a simple full body ROM assessment followed by work to increase joint motion using static pressure, static pressure with passive and active motion, active resistance, and then retesting after the work is compete. The final part is working on the client in the seated position. Static pressure is the most simple type of massage and involves holding one spot and not moving. It can be performed from 8 seconds to 60 seconds. Historically there are variety of different modalities that have taught therapists to hold within these ranges. For example, many trigger point therapy modalities recommend holding spots for 8 seconds and returning to the same spot several times. Other types of bodywork like Rolfing will hold one spot continuously for more than 60 seconds. When performing a structural massage session, instead of adhering to a certain amount of time, we hold each spot until we feel the tissues soften. Sometimes this is 8 seconds, sometimes it is 60 seconds or more. Basically we hold until the body responds. The great thing about static pressure is that not only is it effective, but it is very safe. Safety is important when working with people with injured tissues, because we do not want to cause any damage. So if someone is really hurting, starting the session with static pressure is a good way to ease into the treatment as you discover what the client needs. It is important that you use the correct pressure. The rule about pressure is that it should be deep enough to elicit a healing response without causing bruising or soreness that lasts more than a day. If the client is sore for two or more days after the massage, then you went too deep. Although you do want to find tender spots and hold them, if you see the client tightening their fists, squirming on the table, or breathing hard, you should lighten up. When you get the correct pressure and hold for a prolonged time, the nerve signals from your pressure enter the spinal cord. Here there are chemicals called enkephalins that are eventually secreted in order to block the signal. Enkephalins mediate (inhibit) nociception. What is nociception? Nociception is the sensory nervous system’s response to certain harmful or potentially harmful stimuli. In nociception, intense chemical (e.g., chilli powder in the eyes), mechanical (e.g., cutting, crushing) or thermal (heat and cold) stimulation of sensory nerve cells called nociceptors produces a signal that travels along a chain of nerve fibers via the spinal cord to the brain. Nociception triggers a variety of physiological and behavioral responses and may also result in a subjective experience of pain in sentient beings. Enkephalins are more powerful than morphine. They are produced in the spinal cord because you body realizes that it does not need to transmit every pain signal to the brain once you have felt it. This is why stubbing your toe hurts so much initially and then after a minute or so the pain starts to diminish. The tissue has not healed, but enkephalins have been produced in order to numb the area. This enkephalin production from static pressure is wonderful, because not only does it inhibit the sensory signal to the brain, but it also inhibits the motor signal to the muscle. This means that as the client experiences the pain starting to diminish, the therapist experiences the muscle soften. When this happens, enough time has been spent and the therapist can move on. Mechanical benefits of static pressure are that it also pushes all the blood out of an area due to compression. When the pressure is released, fresh blood rushes in, bringing oxygen and nutrients to the tissues that may be struggling because of reduced nutrients due to tight muscles reducing blood supply. This breaks the pain-spasm-pain cycle. What is the pain-spasm-pain cycle? The pain/spasm/pain cycle is at the root of chronic pain. First an injured muscle sends pain signals to the spinal cord. The first reaction to pain is always to tighten up, so the spinal cord sends a message to the muscle making it contract even more. This increased tension squeezes the vessels that bring blood into the muscle. This reduced blood supply means that the muscle runs out of the energy that it needs to relax (it takes ATP for the muscle cell to relax). A reduced blood supply also means that waste products are not washed away, so acids build up around the muscle tissues, causing increased tissue irritation. These increased pain signals are then sent to the spinal cord and the process continues. Static pressure with motion is applying static pressure to a muscle and moving the joint through its range of motion while the client relaxes and is passive. This can be done passively where the therapist moves the joint, or actively, where the client does the motion themselves. This type of work is nothing new. This work may have a lot in common with Pin and Stretch, or Active Release Technique(ART), although Structural Massage as taught in this manual was developed based on basic bodywork principles, and obvious applications. So any similarities or differences to other bodywork styles is simply a matter of many people finding something that works. Because of this, we will call this type of work static pressure with passive motion, and static pressure with active motion. Static pressure with passive motion is more gentle than active motion, and so it is the next modality after simple static pressure. When we work we slowly increase through the levels of intensity. It is important when performing this technique to move the joint from neutral into the movement that you are trying to increase. Not much benefit is gained by moving the joint through the full range. The most benefit is gained when the muscle starts to stretch. When the joint is moving, the muscle is elongating under our pressure, which manually stretches the muscle fibers in a very specific spot (the spot under your thumb). This specific mechanical lengthening is very effective at releasing tension. Static pressure with active motion involves the client moving their joint while you apply pressure to the muscle. If done correctly it usually includes some laughing because when you push on the muscle, it makes it hard for the client to actually do the motion that you are asking of them. This modality has the same benefits of mechanically lengthening the muscle as the passive movement, but it adds an extra neurological benefits of reciprocal inhibition (for more on reciprocal inhibition, see active resistance below), as well as teaching the body that it can actually move into the new range. This neurological reprogramming should not be underestimated. Static pressure on a muscle can inhibit pain signals. Often people will not move a joint through it’s full range because of pain. Not using the full range contributes to muscle tightening. Numbing the pain with static pressure and then encouraging the client to move through the full range will dramatically increase range-of-motion and remind the client’s body that that full motion is available. This specific modality is the most effective we have ever seen. If you are short on time and can do only one technique, perform static pressure with active motion. Active resistance is based on the physiological principles of reciprocal inhibition and post isometric relaxation. What does this mean? Reciprocal inhibition is when a muscle contracts, the body actually inhibits the opposing muscle group(the antagonist). For example, if you tighten your biceps, the triceps is relaxed. This happens so that you can have effective muscle contraction without muscle groups fighting each other. 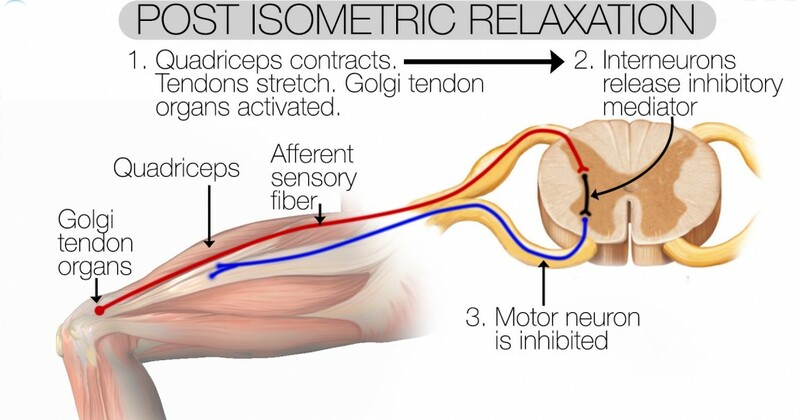 Post isometric relaxation happens when a muscle contracts without the joint moving (the isometric part of the word). After the muscle stops contracting, it’s tone setting is reduced. This is very different than a normal concentric contraction where the muscle actually shortens as the joint is moving. When the muscle contracts without shortening, it tricks the golgi tendon organs into reacting and sending out an inhibitory signal to prevent over stretching. All of this happens in the spinal cord below the level of consciousness. Technically the afferent nerve impulse from the golgi tendon organ enters the dorsal root of the spinal cord and meets with an inhibitory motor neuron. This stops the discharge of the efferent motor neurons’ impulse which results in the reduction of tone. The technique we are calling active resistance is nothing new. What we are showing is similar to Muscle Energy technique, and also a modality called Post Isometric Relaxation (I like that they named the technique after the physiological principle) used by fitness professionals. We called this technique active resistance because it describes how to do it. Specifically, take the joint to the end range where we can feel a slight resistance. Then ask the client to pull away with 10-20% of their strength for 8 seconds. When they stop resisting, do not move for 1 second, then move to a new barrier and repeat. Do this in sequence 3-5 times. After the contraction, move the joint through the full range of motion to reset normal movement pattern. Simply put, after moving a joint to it’s extreme end range, they can get a little creaky. Moving through the full range prevents that. Active resistance is incredibly effective. As we go through the techniques in this course, many times we don’t cover all the muscles that perform a certain motion. Anything we didn’t touch with the other techniques gets addressed automatically through this technique. It is that powerful! Bodywork is a physical conversation with the body. Some people think that deep, painful pressure is helpful. This is akin to yelling at someone who is injured. There is no reason for our work to be painful, we should never have to tell our clients that they should “take it”. Deeper is not always better. Some soreness is great, but it should be able to be received with a relaxed body. So watch your client’s hands and body as you apply pressure, and if they are squirming or clenching their hands, decrease your pressure. Think of bodywork as an act of love, and let your touch be filled with a calm, peaceful presence. Being unhurried and spacious in your own being will entrain the client’s body to gently release into healing. As a side note- most lawsuits involve the client asking the therapist to lighten up and the therapist telling them the pressure is good for them. When the client is injured, the therapist ends up in court. Listen to your clients and be gentle. Why should massage feel good and be enjoyable to receive? When a muscle becomes tight for too long it becomes inflamed. It becomes inflamed because the tension in the muscle restricts blood flow into the muscle. When there is not enough blood flow into the muscle, cellular wastes accumulate in the muscle and the muscle is not able to get enough oxygen. This irritates the nerve cells, and causes you to feel pain. Every muscle in the body has an individual tone setting. This means that some muscles in the body are tighter than others. When we have an injury the muscles around the injury can keep a heightened tone for many years afterwards. We refer to these areas of tightened muscle tissue as the areas where we hold our tension. This tone setting operates even when we’re not using our muscles. For example, when we sleep some muscles still retain their tension during the night. These muscles are more prone to inury and pain. Nerve cells must reach a threshold value in order to send a pain signal. This means that a muscle can be a little bit tight without the nerve cells sending any pain signals. However, if the muscle tightens any more, the nerves will be pushed over their threshold and start sending pain signals. When we become stressed, our sympathetic nervous system slightly tightens all of the muscles in our body. This is why we experience more pain when we are stressed. By increasing the stress we increase muscle tone. The reverse is also true. By decreasing stress we decreased the tone in our muscles. Because stress is often unconscious, we may not notice, or understand, why our muscle pain is coming and going. This is commonly called the stress bucket syndrome. The analogy is a bucket full of water. The water represents stress. When you have too much water the bucket starts to overflow and you feel pain. Do something that’s relaxing and it allows some of the water in the bucket to drain out. Muscles that are habitually tight can be seen to be buckets that are almost full of water, and just a little stress will cause the overflow, which then triggers the nerves to reach their threshold, resulting in pain. When massage is relaxing and enjoyable, it permanently lowers the tone setting in the muscles, helping the client stay out of pain. Working with clients who are in pain is what Structural Massage is for. Areas of tenderness and discomfort are areas that you should focus on during the session. But how do we communicate with our clients in a way that is appropriate? Ask your client if they would like you to go deeper or lighter, don’t ask them if the pressure is ok. If you ask them if the pressure is ok, due to social pressure they will most likely say it is fine, even if it is too deep. If you ask them if they would like the pressure to be more or less. With this question they have to break the social contract and offer a third option, which is to say that the pressure is perfect. Asking this way gives them permission to ask for deeper or lighter pressure, and if they say it is perfect, you know they are telling the truth since it is the hardest answer. Another option for communicating with your client regarding the depth is to use a pain scale. 10 being excruciatingly painful, and 1 being nothing. Proper massage work does not go beyond a 7 in the level of discomfort. This is the “hurts so good” type of pain, where the pressure is deep enough to get into the area of discomfort, but it also feels good at the same time. At this level, enkephalin production is maximized, and the work feels good at the same time, releasing all the other chemicals that lower tone settings throughout the body and put the client into a nice altered state. Muscles are classified as agonists and antagonists. Agonists perform the action, antagonists perform the opposite action. For example during elbow flexion, the biceps brachii is an agonist, and the triceps is an antagonist. During the opposite motion, elbow extension, the triceps becomes the agonist and the biceps becomes the antagonist. When we perform range of motion tests and find a limitation, the antagonists muscles are the ones that will limit that motion. For example, if elbow extension is limited, it will be because of the biceps muscle. As you go through this course, it sometimes becomes confusing because sometimes we perform strength tests (especially in the shoulder). Strength tests assess how the agonist muscles perform, and in that case we will actually perform work on the muscles that elicit pain. Hang in there and it will all become clear.